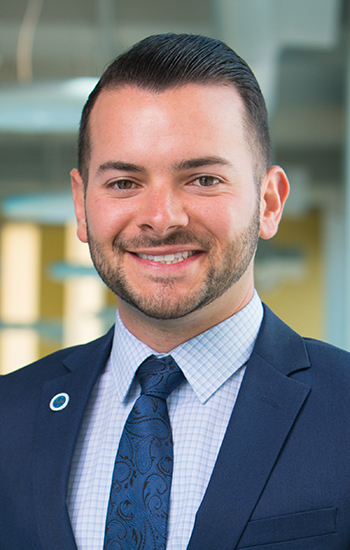 Dr. Fusco serves as Clinical Associate Professor and Interim Director, Office of Experiential Education within the Department of Pharmacy Practice at the University at Buffalo School of Pharmacy and Pharmaceutical Sciences (UB-SPPS). He practices/teaches in acute care pediatrics. His teaching activities focus on pediatric pharmacotherapy and interprofessional education. His educational scholarship focuses on interprofessional education, and his clinical scholarship focuses on pediatric infectious diseases. Fusco NM, Prescott WA, Meaney CJ. Pharmacokinetic Monitoring of Vancomycin in Cystic Fibrosis: Is It Time to Move Past Trough Concentrations? Pediatr Infect Dis J. 2019; 38(3). Fusco NM, Foltz-Ramos K. Measuring changes in pharmacy and nursing students' perceptions following an interprofessional high-fidelity simulation experience. J Interprof Care. 2018. Prescott WA, Violanti KC, Fusco NM. Characterization of Vaccination Policies for Attendance and Employment at Day/Summer Camps in New York State. J Pharm Pract. 2018. Holsen MR, Meaney CJ, Hassinger AB, Fusco NM. Increased Risk of Acute Kidney Injury in Critically Ill Children Treated With Vancomycin and Piperacillin/Tazobactam. Pediatr Crit Care Med. 2017; 18(2). Jacobs DM, Holsen M, Chen S, Fusco NM, Hassinger AB. Procalcitonin to Detect Bacterial Infections in Critically Ill Pediatric Patients. Clin Pediatr (Phila). 2017; 56(9). Kiersma ME, Chen AM, Blake EW, Knell ME, Fusco NM, Kleppinger EL, Creekmore FM, Gillespie ME, Mody V. Evaluation of Criteria Utilized in the Recognition of Teaching Excellence Awards. Currents in Pharmacy Teaching and Learning. 2016; 8(4). Fusco N, Gonzales J, Yeung SY, Fusco NM. Evaluation of the treatment of diabetic ketoacidosis in the medical intensive care unit. Am J Health Syst Pharm. 2015; 72(23 Su). Lardieri AB, Fusco NM, Simone S, Walker LK, Morgan JA, Parbuoni KA. Effects of Clonidine on Withdrawal From Long-term Dexmedetomidine in the Pediatric Patient. J Pediatr Pharmacol Ther. 2015; 20(1). Fusco NM, Parbuoni KA, Morgan JA. Time to first antimicrobial administration after onset of sepsis in critically ill children. J Pediatr Pharmacol Ther. 2015; 20(1). Fusco NM, Parbuoni K, Morgan JA. Drug utilization, dosing, and costs after implementation of intravenous acetaminophen guidelines for pediatric patients. J Pediatr Pharmacol Ther. 2014; 19(1). Jacobs DM, Holsen M, Chen S, Fusco NM, Hassinger AB. The Utility of Procalcitonin to Support Clinical Decision Making in Critically Ill Pediatric Patients. Open Forum Infectious Diseases. 2016; 3. Holsen M, Chen S, Fusco NM, Hassinger AB, Jacobs DM. The Utility of Procalcitonin to Support Clinical Decision Making in Critically Ill Pediatric Patients. Pharmacotherapy. 2016; 36(12). Fusco NM. Evaluation of meropenem use at a children’s hospital. American Journal of Health-System Pharmacy. 2016. Kiersma ME, Chen AM, Blake EW, Knell ME, Fusco NM, Kleppinger EL, Gillespie ME, Body V, Zavod R. Pharmacy Student Perceptions of Teaching Award Recipients and Teaching Excellence. American Journal of Pharmacy Education. 2015. Kiersma ME, Chen AM, Blake EW, Knell ME, Fusco NM, Kleppinger EL, Creekmore FM, Gillespie ME, Body V. Enhanced Student Awareness and Recognition of Scholarly Teaching. American Journal of Pharmacy Education. 2014. Fusco NM, Gonzales JP, Young SYA. Evaluation of the Treatment of Diabetic Ketoacidosis in the Medical Intensive Care Unit. Critical Care Medicine. 2012.